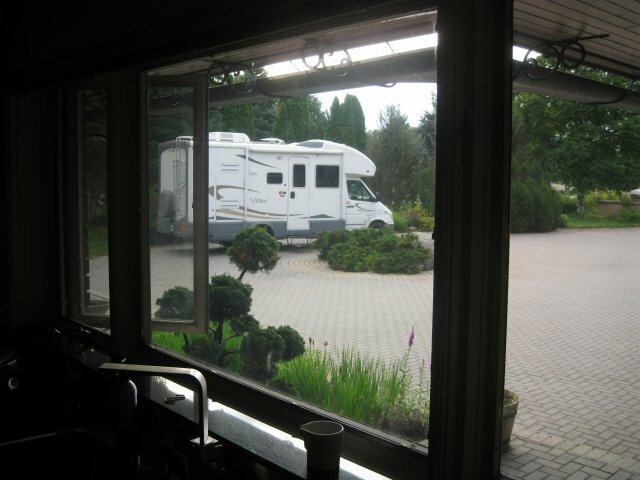 Last night we stayed with Nortel friends, John & Yolanda, in their driveway. They have a very interesting home in Ottawa. Many of the details are Frank Lloyd Wright. The photo taken out the kitchen window shows the unique eave troughs which are hung below the eaves. John is working with a group of former executives to save Nortel so we had lots to talk about. Today we repeated the same route we took a year ago on our way to Vancouver Island. The road must have taken a real pounding last winter as it was pretty rough for much of the 259 miles. Tonight we are at a small campground with lots of permanent trailers. It is right on Lake Nipissing. Tomorrow we cross the border at Sault Ste Marie and will be back in the USA.